For starters, SecurDisc is duplication protection feature for PDF files so that they can be only read and not copied, edited or sent electronically. Files protected using SecurDisc can only be distributed using an original DVD which is read by the recipient with the help of a SecurDisc drive and SecurDisc Viewer application. 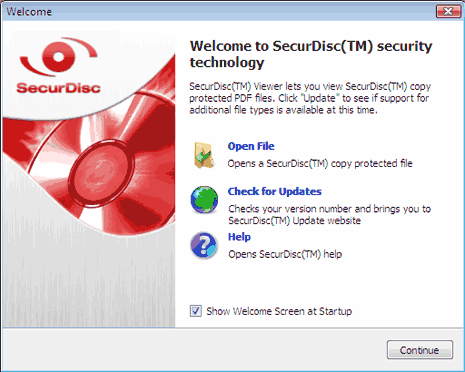 You can download free SecurDisc Viewer program to open and view PDF documents password protected by Secure Disc. 1. Insert the Secure Disc DVD containing protected PDF file. 2. Open SecureDisc viewer & click Open file icon. 3. Select PDF file (double clickling on protected PDF file wont work). 4. After selection, click Open button. You will get prompt for password (if it has been set). 5. Enter the password and click OK to view PDF file protected by SecureDisc. 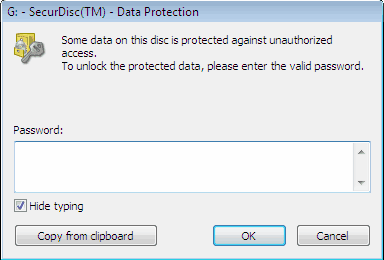 Download SecurDisc Viewer to easily view PDF protected files by SecureDisc procedure. You will also need Adobe Acrobat reader installed on PC for this viewer to able to open your SecureDisc protected PDF files.